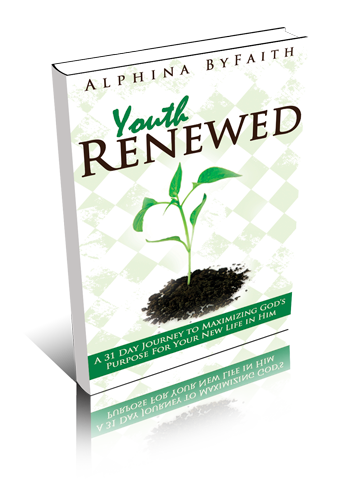 Whether you just met God for the first time, are rebuilding your relationship with Him, or endured the refiner’s fire and came out rebuilt, restored, and healed by God, Youth Renewed is a timely tool for you. God has a specific purpose for YOU and He has provided all you need to be renewed as the eagle, and to live in the fullness of all He promised. However, your ability to mount on and remain on eagles’ wings depends on YOUR deliberate participation, strategic steps, and purpose driven choices that YOU will make, in accordance to what He has instructed. Is there a change you desire? Will you do what you’ve never done for and with God, to get what you’ve never received before? Are you determined to remain renewed and enjoy all the benefits therein? Join this 31 day journey to maximizing God’s purpose for your new life and you will soon discover that you are more powerful than you know.